It was nice to get out climbing again. I hadn't been up to the mountains since December 2012 for a variety of reasons, including car problems and Muffin's declining health. It was a clear day with blue skies and relatively mild temperatures, even though there was still a bit of snow on the ground at higher elevations. The Moosilauke Ravine Lodge Road had just opened for the season, making this the good choice of destinations for the day. The Gorge Brook Trail officially begins at the turnaround at the end of Ravine Road, heading downhill and circling in back of the lodge on the other side of the Baker River, but as usual, I just cut across the lodge's rear lawn and crossed a bridge over the Baker River to meet up with the trail. After crossing a second bridge over Gorge Brook, where the Gorge Brook Trail used to bear right, a sign indicated that both the Gorge Brook and Snapper Trails continued straight ahead because major damage from Tropical Storm Irene had made it necessary to reroute a portion of the Gorge Brook Trail. A bit further up the trail, the newly-rerouted trail branched right back toward the brook. A sign announced that this was now called the Wales Carter Connection. The Snapper Trail was covered a shallow layer of decaying snow and ice. Snowshoes were unnecessary but I put on my microspikes to keep from slipping around on the bumpy terrain. 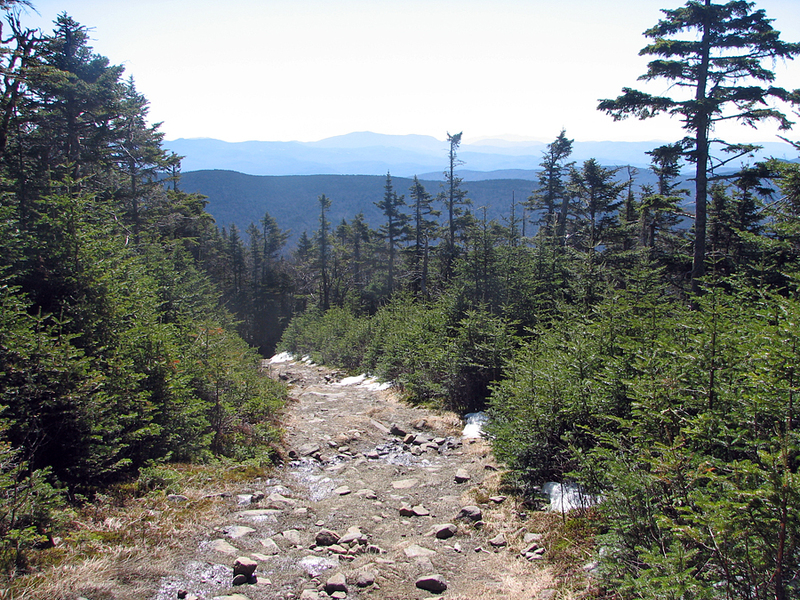 At the Moosilauke Carriage Road junction, I turned right to follow this wide trail to the summit. There were a few dry patches along this trail, but they were separated by deep wet and decaying drifts which made going rather slow. Never-the-less, it wasn't really worth putting on snowshoes because there was always a bit of bare rock in between the drifts. After passing the Alpine Area warning sign and snowmobile-blocking boulders, the trail became steeper and more evenly snow-covered. 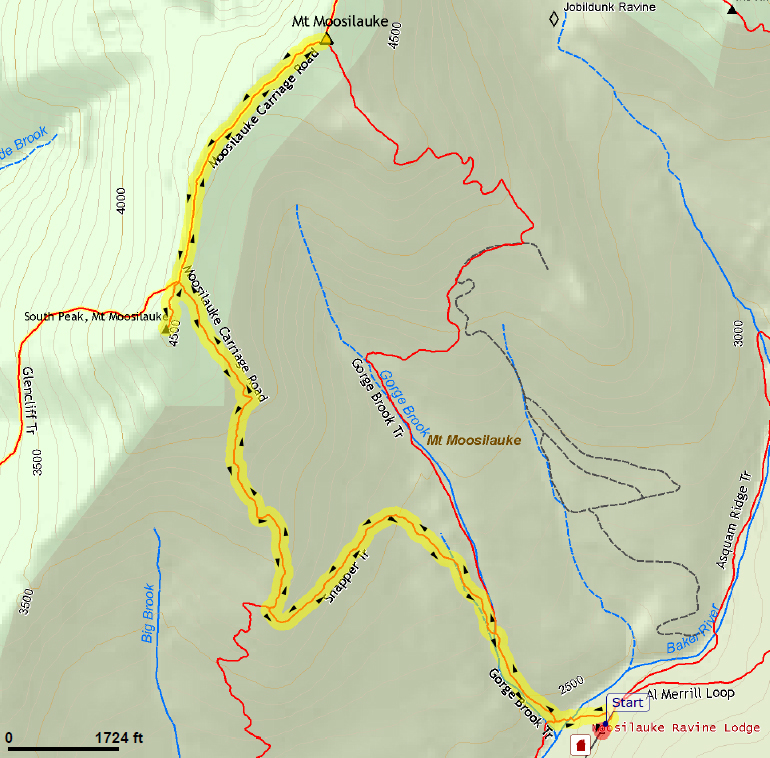 I passed by the turnoff for the Mt Moosilauke Spur that climbs up to South Peak, but planned to make that side trip on the way down since I had never climbed South Peak before. 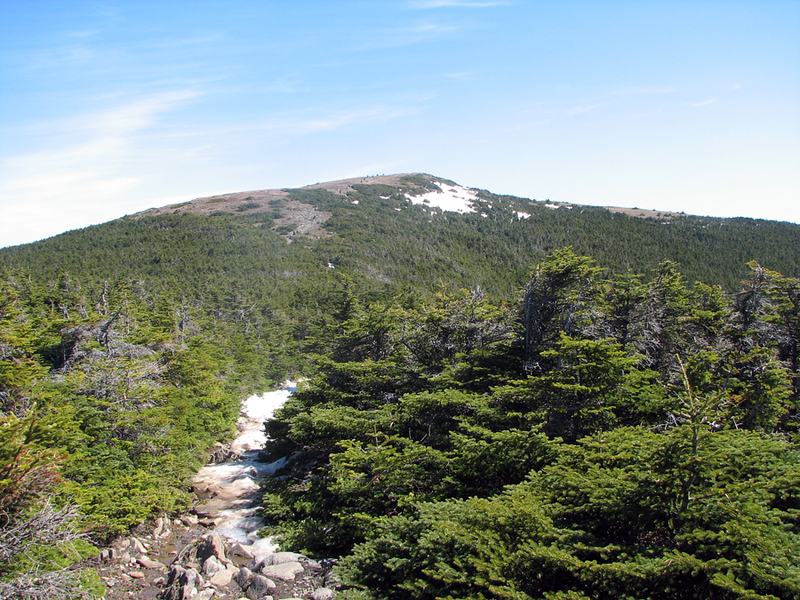 Soon, the trail began to level out a bit and the Mt Moosilauke summit cone loomed ahead. There was a large snowfield on peak's south side, but the route of the Carriage Road was obviously snow free above treeline. I was a bit tired from trudging through the slippery wet snow and drifts on the Carriage Road, so I slowly ascended the last leg of the trail past a twisting line of cairns up to the summit. But suddenly I was on top and the views were spectacular against the deep blue sky. To the northeast, the Franconia, Twin/Bond, and Presidential ranges seemed almost closer than they were thanks to the clear crisp air. I could easily pick out all of the Franconia peaks, from Flume to Lafayette, and Mts Jefferson, Washington, and Monroe in the Preseidential range. However, I wasn't familiar with identifying the Twins or Bonds from this angle. Further to the south, the town of Lincoln and the Loon Mountain ski trails were unmistakable. High above, there was an interesting cloud with feathery whisps of ice particles blowing almost straight up from a lower flat base. I tried to find out whether there was a name for this type of cloud formation but have had no luck so far. On the way back down, I made the side trip to South Peak as planned. 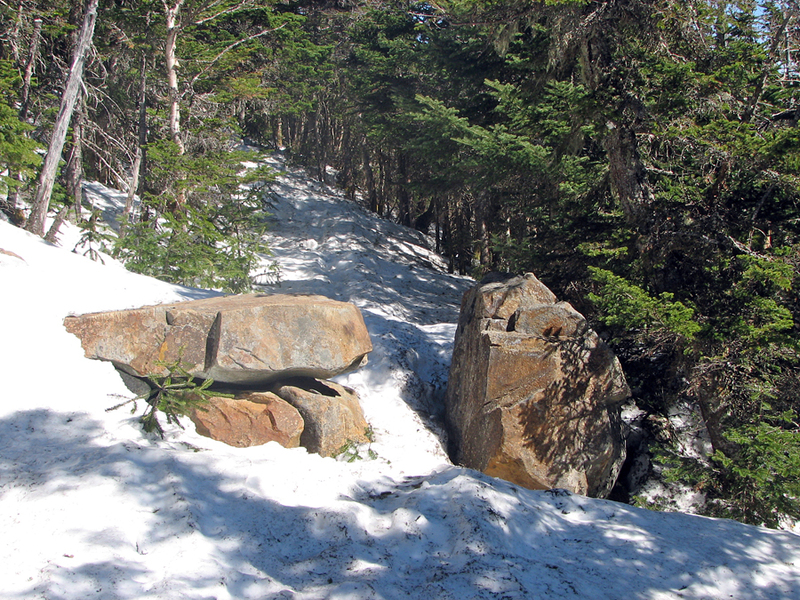 The Spur Trail to the summit had been less heavily used than the Carriage Road and the drifts were deeper here but the distance was short, and I soon stood at the top overlooking the main summit from which I had just come. This had definitely been one of those rare days where spring was in the air but winter had not quite finished retreating, leaving just enough cold calm air to keep the skies clear. Moosilauke Ravine Lodge from the rear. 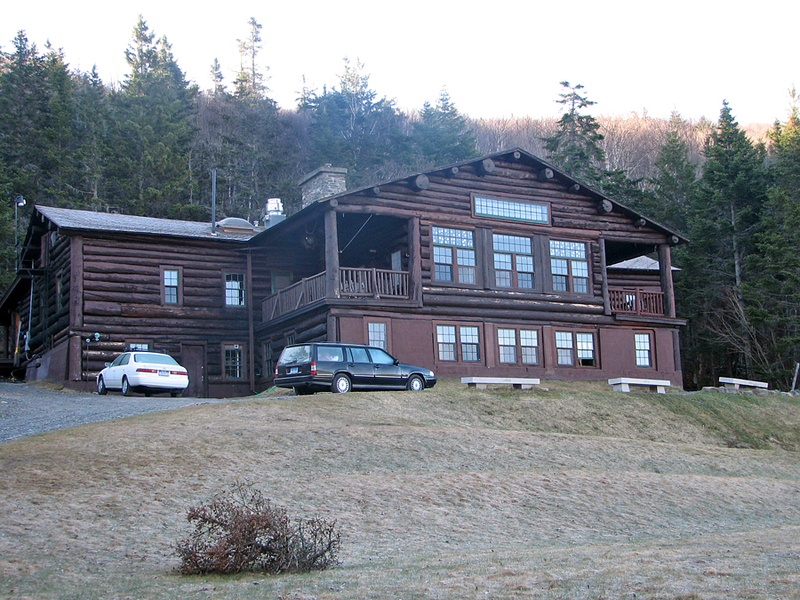 The lodge is owned by the Dartmouth (College) Outing Club, which also maintains the trails. 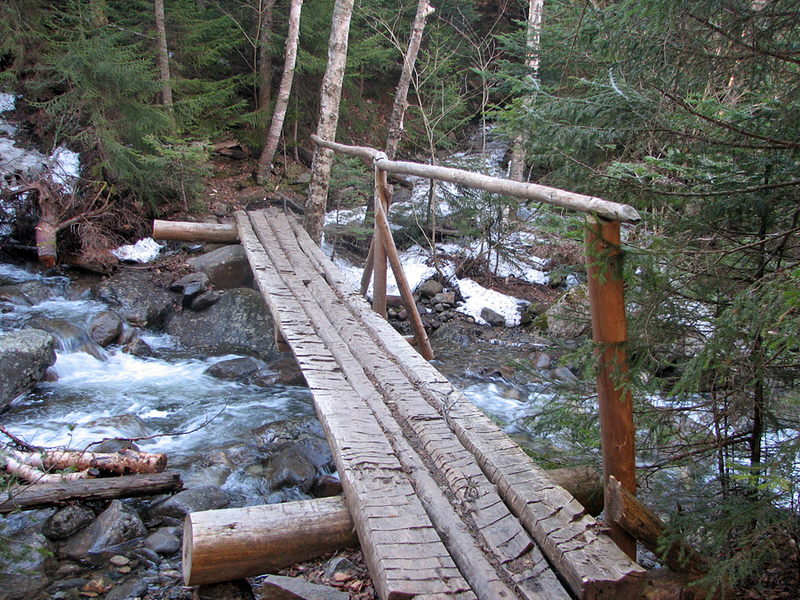 The bridge over the Baker River at the start of the trail behind the lodge. 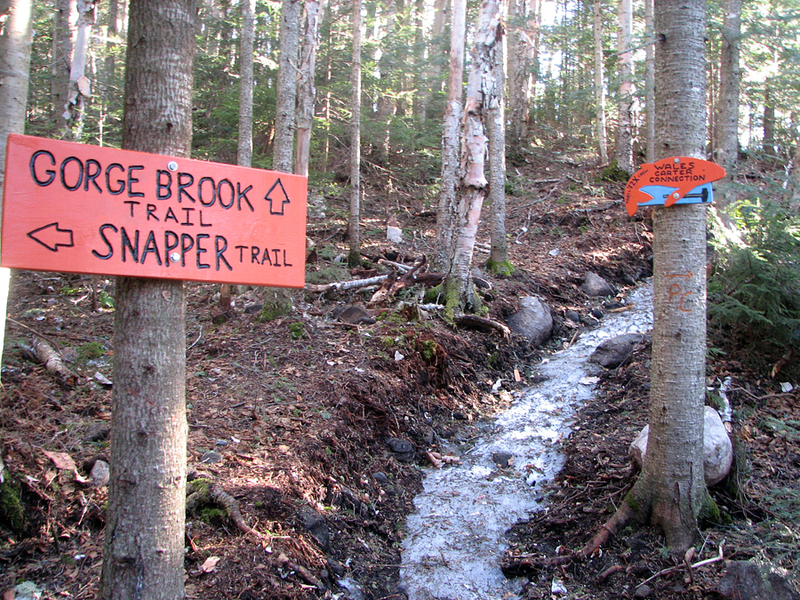 New junction of the Gorge Brook and Snapper Trails. Parts of the lower Gorge Brook Trail that were right next to the brook were heavily damaged by Tropical Storm Irene. Snapper Trail. This fairly level trail connects the Gorge Brook Trail to the Moosilauke Carriage Road. View south from the Moosilauke Carriage Road. 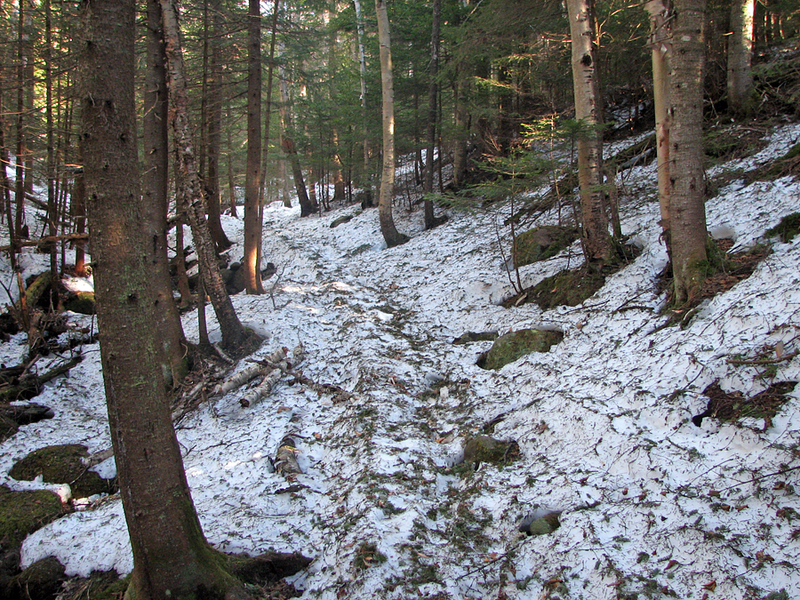 There were rare dry patches along this trail separated by deep drifts. 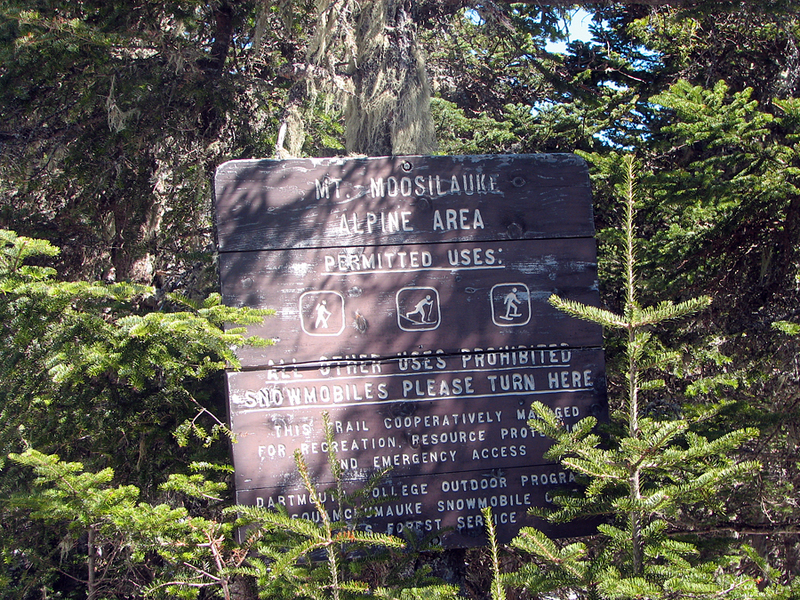 Alpine Area sign. Up to this point, snowmobiles frequently use the Carriage Road in the winter, but they aren't allowed any higher. Large boulders that block access to any snowmobilers who don't pay attention to the warning sign. 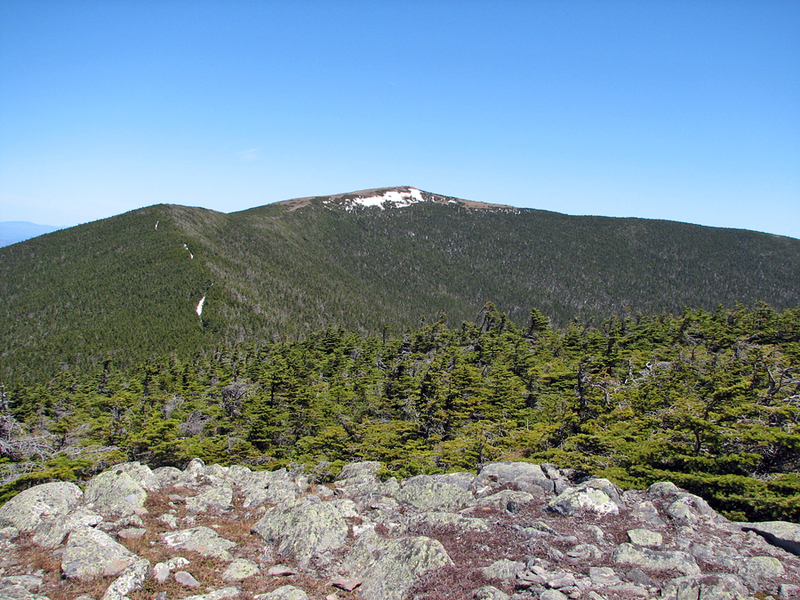 Moosilauke summit cone from the Carriage Road not far above the South Peak/Glencliff Trail junction. 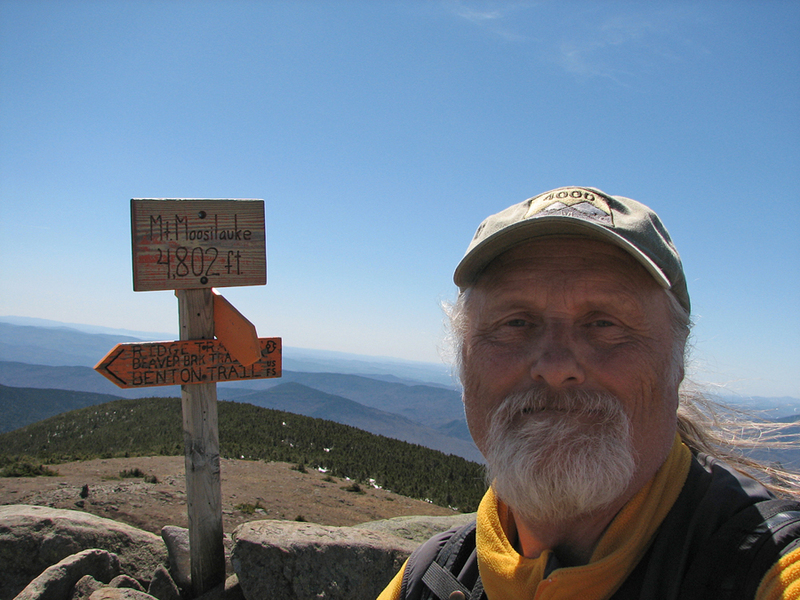 Self-portrait on the Mt Moosilauke summit. As you can see, the day was clear and the sky deep blue. Interesting cloud above Mt Moosilauke. I tried to find out whether there was a name for this type of cloud formation but have had no luck.. 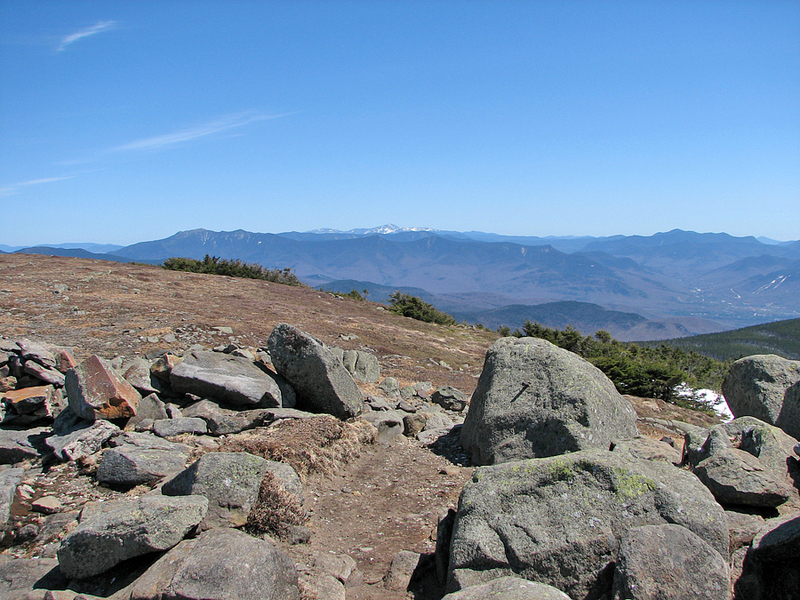 The Franconia, Twin, and Presidential ranges from the top of Mt Moosilauke. Closeup of the same view. 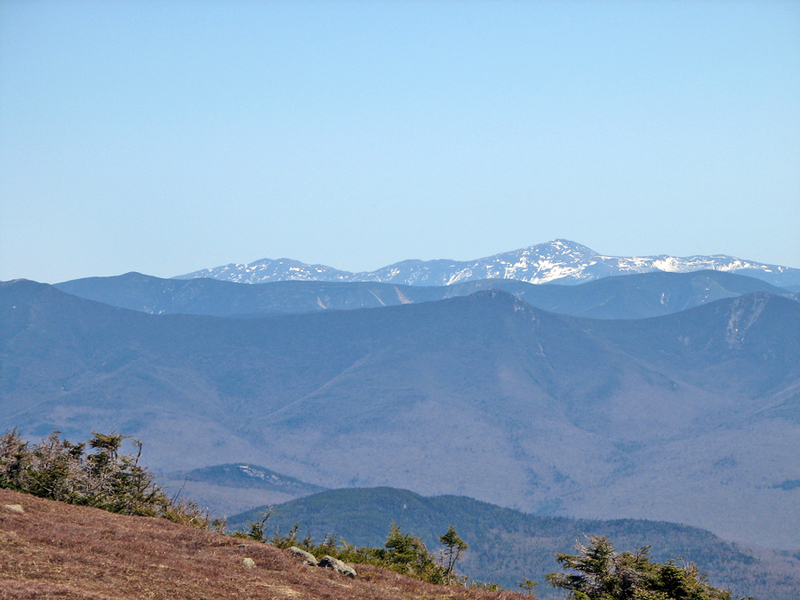 Mts Jefferson and Washington dominate the further Presidential range while the peaks visible on the Franconia Range are Little Haystack, Liberty, and Flume. 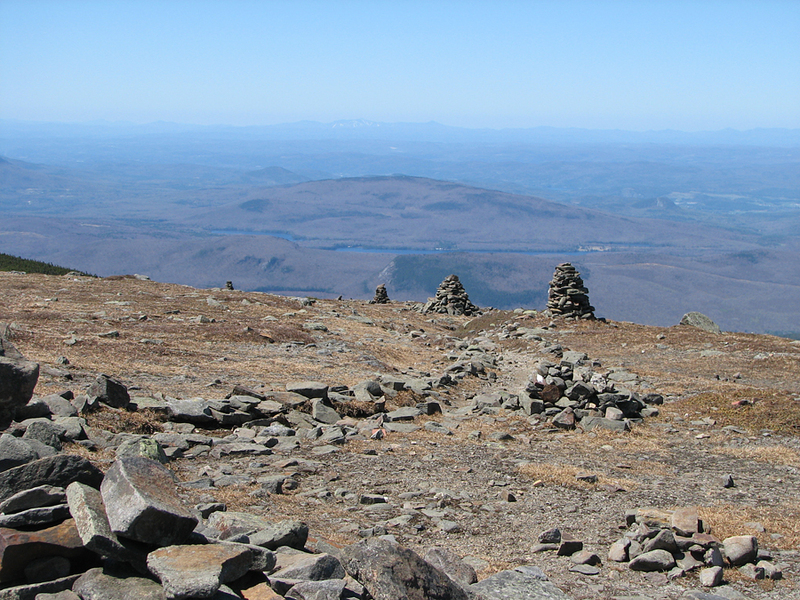 The line of cairns marking the Moosiilauke Carriage Road's descent down the southwest side of the mountain. 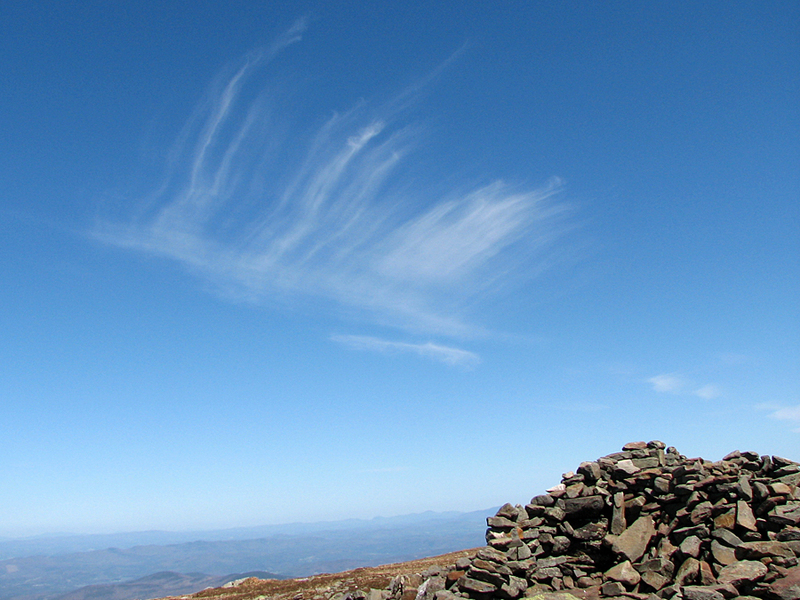 Mt Moosilauke from the summit of Moosilauke's South Peak.